Rubberexpansionjoint.com TU style molded rubber expansion joints are the choice when an economical threaded pipe connection is needed. 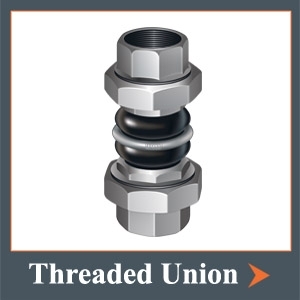 The TU is engineered to absorb thermal movement, offset and misalignment in piping systems. The TU style is an excellent choice to absorb and isolate vibration. Use the TU to protect your system from start-up forces as well as system surges. There is no need to worry about Electrolysis when using a TU. Due to the design of the TU having a rubber body it eliminates metal to metal contact stopping the electrolytic process. 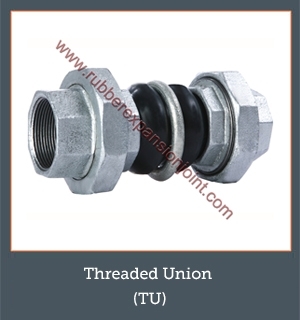 The TU comes standard with galvanized ductile iron female unions. Stainless T-304, T-316 and Bronze unions are also available. The TU rubber expansion joint comes standard and in stock in 100% EPDM and 100% Neoprene for same day shipment. The body components (tube/cover) are also available in a combination of the following additional materials on special order: Neoprene, EPDM, Chlorobutyl, Nitrile, Hypalon®, Viton®, Natural Rubber etc. Please see the materials table to determine what material is best for your application. The TU is also available on special request with the following female union threads: BSPP, BSPT and other standards.